draws off, by opening valves, ammoniacal liquor from time to time from scrubbing plant; runs in fresh water; may also draw off liquor from condenser; usually done by scrubber man q.v. periodically renews carbons, overhauls, cleans, trims, and renews globes of arc lamps; patrols circuits iat switching on time and attends to faulty lamps, including other than arc lamps. fits assembles parts and burners for lighting purposes in houses, street lamps, etc. ; usually done by gas fitter (235) q.v. slang term for workman doing same work as another on opposite shift. watches pressure gauges on gas condenser plant; opens and shuts valves to ensure proper functioning. watches level of water in filter bed and opens and closes valves or sluices, as required, to regulate supply of water to filter bed; if water is low, reports to filter bed foreman (692) q.v. in case bed should need cleaning; if water is high, operates valves in consultation with pumping engineer (690) q.v. ; reports faulty valves to foreman or fitter (692) q.v. on maintenance staff. see stageman (oil gas) ; cf. water gas maker (953). removes filled recorder sheets or charts, showing water evaporated, steam pressure, water temperature, etc., from plant and sends to engineer; tests producer gas as it leaves producers, tests waste gases as they leave flues from retort house, and reads temperature of retorts on pyrometer to ensure that producer gas is heating retorts correctly; draws sample of producer gas from main and analyses roughly a fixed volume of it, dissolving carbon dioxide in potash solution, and carbon monoxide (most important constituent) in special cuprous salt solution; in similar way analyses sample of waste gases testing for oxygen (by dissolving in it pyrogallol) and carbon dioxide (by dissolving it in potash solution); reports results of tests to foreman who regulates supplies of air to producers (primary air) and to retort bench (secondary air). has charge of, and takes readings from, pressure and depth gauges. attends to proper weighting of station governors which control supply and pressure of gas to each district. (ii) calls periodically (or when requested) to inspect gas mantles on private premises, and replaces damaged mantles. see stage man (oil gas). a fitter who, by means of specially constructed apparatus, subjects pipes in mains to hydraulic pressure much in excess of that to which they will normally be subjected; works under direct instructions of district superintendent (690) or district foreman (692) q.v. attends to pressure recorders which are fitted at certain points to gas mains and are enclosed in iron pit; opens grate of pit to gain access to recording clock; removes squared paper from dial and replaces with new sheet; winds up clock, cleans pit and closes grate. patrols circuits at switching on time and gives attention to faulty lamps other than arc lamps, for which see arc lamp assistant; reports to street lighting engineer (691) through foreman (692) q.v. controls rate and direction of flow of gas into, and out of, purifying sheds, by means of valves; makes tests at various points, e.g., with lead acetate paper for presence of hydrogen sulphide; supervises work of purifier men (699) q.v. 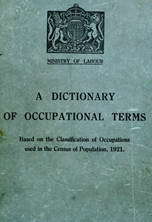 makes periodic record of readings of instruments on switchboards, from which readings are calculated output, load, etc. ; sometimes done by switchboard attendant (954) q.v. ; (gas works), see gas tester. has charge of reservoir and grounds; keeps grounds clean and tidy; excludes trespassers; usually living .on premises. watches pressure gauge of scrubbers i.e., towers of broken coke over which water trickles or rotary washers, used to remove last traces of ammonia, benzol and naphthalene from gas; opens and closes valves and taps as directed, to draw off liquor and admit fresh water; sometimes also cleans feed and all other pipes connected with scrubbers, with an iron rod or similar implement; in more modern practice also does work of purifier attendant and tower man (699) q.v.) makes repeated tests at different points of condensing and purifying plant by inserting measuring rod to ascertain depth of tar accumulation, or lead acetate paper to detect presence of hydrogen sulphide; may set pumps in action as required, etc. gauges flow of water in supply springs by reading and noting depth of supply springs on marked measuring poles or boards erected in them; reports to appropriate pumping station. works on staging over and around oil gas plant; controls by opening and closing valves flow of steam to generator, of oil and gaseous products from generator to carburetter, and of carburetted water gas into superheater; controls outflow of carburetted water gas (or oil gas) from plant. pumps out condensed liquor from sections of gas main into which liquor drains from pipe owing to suitable flight inclination of mains; uncovers manhole, sets up small hand pump, opens valve connecting pump with main and pumps out liquor; takes round pump on cart or trolley. turns off gas supply from main to houses, etc., when unoccupied, or for other reasons; turns supply on again when required; (not London term). controls supply of water in street mains; turns off water supply in case of leakage; visits consumer's premises, on request, to turn off supply; in some districts is present at flushing operations to record length of time operations are in progress and so to calculate charges due; sometimes also accompanies fire brigade to regulate water supply at high pressure; sometimes also accompanies waste inspector (692) q.v. to turn water supply off and on. accompanies turncock q.v. ; usually carries tools; deputises for turncock if and when necessary; usually a youth under training. controls valves leading from gas main (containing purified coal gas) to gas holders; also controls, by means of valves, outlet pipes from gas holders to distribution mains; reads and records temperature and pressure, and make of gas, as shown by station meters, and quantity of gas sent out from gasholders; usually also in charge of "boosting" plant pumps, where these are used, for maintaining adequate pressure in gas mains over a large area. keeps mechanical washers clean by scooping out tar, etc., deposited by gas in passing through them. controls sluices or valves by which water is let into and out of reservoirs. has charge of, and keeps clean, waterworks premises, e.g., pumping stations and grounds, residing on premises; often same as gate keeper (962) q.v. ; may be reservoir keeper q.v.